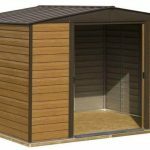 This is a basic security shed that has a pent roof. It has been made with galvanised steel throughout, and has ventilated gables in the roof. The shed has no windows as a security measure, and has double sliding doors. 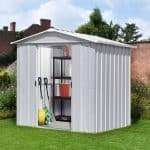 This is a metal storage shed that has a pent roof. 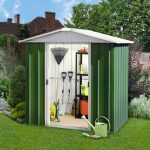 The shed measures 277 cm in width and 142 cm in depth. The roof is a pent roof, which means that you get more for your money due to the fact that it allows rainwater to run off much quicker than it would on a flat roof, for example. While this builds in plenty of long-life aspects for the product due to less chances of rust, the galvanised steel makes the building essentially rust-free. Galvanised steel is tough and strong, but it has also been coated with zinc. This means you have a roof that is not going to suffer from rust. This has plenty of benefits, obviously, because your building will last longer. But when you consider that the building is rust free, it makes it a lot easier to buy. 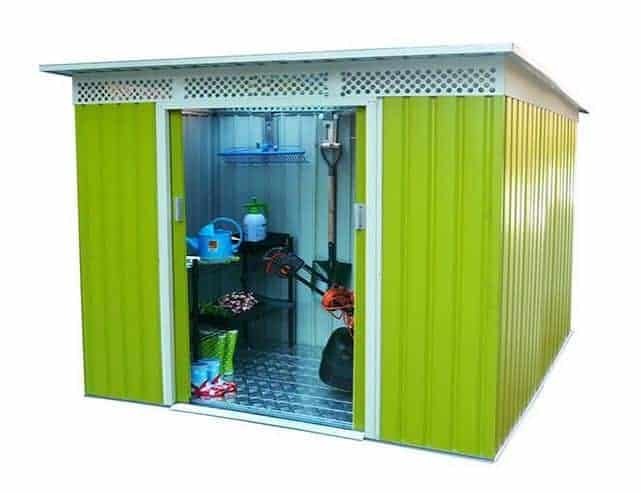 You can safely store your metal items in the shed without having to worry about erosion. And it’s big enough to store bikes alongside the tools and equipment you use in your garden too. The lack of a window in the unit means more security also. Thieves are not going to be able to see inside the building and will therefore be deterred from entering. The gables in the roof are also ventilated, so you have less condensation inside the unit. This again adds value, by ensuring your items are not damaged over time by poor air quality. That galvanised steel counts for a lot, and the manufacturers have built the unit in it, so you have a rust free building. On top of that, the zinc-coated building will also have plenty of life in it, because the treatment actually strengthens the metal. 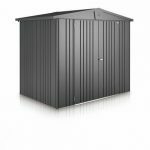 We were impressed with the solidity of the building, and the galvanised aspect presents great value, especially in this price range. In addition, you also get corrugated walls. This builds in plenty of strength to the equation, and you have this along with the galvanised aspect. So it’s a double whammy as far as we are concerned. The Bella is not supplied with any flooring. You do get a foundation kit and once you have filled this with cement you can place the Bella on there, and look forward to a solid construction. We were quite glad to find a foundation kit in the box, because they are not always supplied. It saves time and some expense too. This building is entirely maintenance free. So there’s no need to apply any treatment. The galvanised steel will stand for a very long time. A good and solid set of sliding doors is included as part of the purchase. These ran well and didn’t stick. We found them smooth and responsive. They also open up to give a full and clear access point. No windows are included in the building due to it being a security shed. The doors are lockable, and it shouldn’t be too much of an extra expense to buy a good padlock. That lack of windows helps with security immensely. Apart from the purchase of a padlock, there are no customisation options. 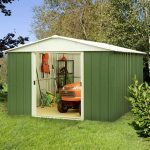 Final Thoughts: This is a very simple and basic storage shed. But that doesn’t mean that it isn’t a great buy. There is plenty of good stuff here, such as the galvanised steel and the pent roof. 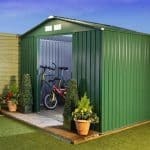 We think it is one of the best value basic security sheds available and we also think the price is a key factor. Solid and sturdy, and affordable too. It’s a winner.